While you were sitting back on the sofa, nursing a food baby after Christmas dinner, Chris Bertish was paddling across the Atlantic ocean on his stand-up paddleboard (SUP). South African-born Bertish set his sights on being the first person to cross the Atlantic, unassisted, on a stand-up paddleboard. And he’s making an impressive stab at it. According to his live tracker, Chris is nearing the halfway mark, with his GPS coordinates showing his location at somewhere to the west of Cabo Verde. Having spent almost two months at sea with nothing other than his state-of-the-art paddle board and some basic provisions, it’s already an amazing achievement. Starting out on December 6, 2016, from the northwest coast of Africa in Morocco, Chris began what he hoped would be a 120-day voyage. That voyage would take him over 4,500 miles across the Atlantic, ending in the Caribbean Leeward Island of Antigua. 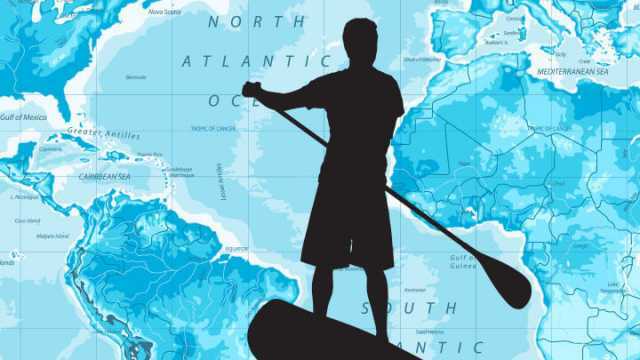 Every day, Chris is forced to paddle the equivalent of a marathon in order to ensure his provisions don’t run out before he reaches that far-off Caribbean destination. And despite averaging a solid three to four knots per hour in paddle speed, there were times when Bertish found himself woefully close to his original point of embarkation. After a solid 14 days of paddling against the elements, Bertish came within 28 nautical miles of the west coast of Africa… the very continent that he had been trying to paddle away from. It was no great surprise to the paddleboarding vigilante, however, who knew that he would sometimes have to accept that his travels would take him backward in his search for favorable tailwinds. Luckily, it looks like those tailwinds are now firmly on his side. Following that first month of hardship, Bertish has now tapped into the same trade winds that have sailors to cross the Atlantic for centuries. The going is still painfully slow, but every day takes the South African adventurer one step closer to his destination. It’s still a ridiculously torturous voyage. So far, Bertish has already been swept overboard, come close to losing a finger, battled with malfunctioning steering on his SUP, capsized, and almost been thrown overboard by what he believes was either a whale or shark bumping into his craft. And he’s only halfway. Bertish’s craft, named the “ImpiFish,” is nothing short of extraordinary. Created by world-renowned naval architect Phil Morrison, the ImpiFish is built with speed and safety in mind. Just under 20 feet in length, the SUP weighs in at approximately 1,350 pounds and boasts a watertight cabin. Not exactly your run-of-the-mill recreational paddle board. The craft features an advanced satellite communication system, two sets of solar panels to power all on-board electronics, a water desalinator for drinking and an auto-pilot system. All this and it has a zero percent carbon footprint. Even though he’s only part-way through his epic journey, Bertish is already breaking world records. On December 13, just seven days into his journey, Bertish passed 193 miles and broke the world record for a solo, unsupported ocean paddle. On December 22, he became the first person to paddle 300 miles in a SUP and with every stroke he sets new records. So what’s all this self-imposed hardship for? For starters, Bertish hopes to raise awareness for ocean conservation and the fragile nature of marine ecosystems. Bertish has also teamed up with a group of corporate sponsors to raise funds for a wide range of projects. One is the Signature of Hope Trust, which aims to build at least five schools in the poorest regions of South Africa. Another is The Lunchbox Fund, which provides an annual dividend to feed and educate thousands of children. There’s also Operation Smile, which provides funds to help pay for life-changing cleft lip and palate surgeries for children. An impressive endeavor and it’s not the first for this avid-adventurer turned thrill-seeker. As a professional surfer, he’s conquered some of the biggest waves on the planet. In 2000, he was acclaimed by swell.com for “Biggest Wave Paddled in the World.” In 2001 he was the first person to paddle in at Jaws, Hawaii. And in 2010, he was the first to surf Seal Island. Going through his impressive credentials, Bertish has a lot of “firsts” to his name. He’s also attached his name to plenty of big-time competitions, placing third in the Red Bull Big Wave Africa, second in Oregon’s Nellscott Big Wave Event and third in the Big Wave World Tour. Put a paddle in his hand and the achievements start to rack up as well. Bertish was the first person to SUP Nellscott Reef. He was first to SUP Dungeons. He placed ninth in the 2012 SUP World Championships. Additionally, he broke the world record for paddleboarding the English Channel in under six hours. With such a stellar story behind him, and so much more to be achieved, Bertish has taken his experiences to the big stage. He’s become a sought-after global motivational keynote speaker, TEDx guest speaker and regularly talks at corporate events and schools. In between talks, surfing and SUPing, Bertish still finds the time to keep his small personal business running. It’s a lesson in just how much we can achieve when we’re passionate about what we do and don’t take “no” for an answer. If Bertish can cross the Atlantic with nothing more than a board and a paddle, imagine what you can do! Interested in Bertish’s progress? Keep track here. Hey Buddy!, I found this information for you: "South African Man Attempts World’s First Atlantic Crossing By SUP". Here is the website link: https://www.thealternativedaily.com/chris-bertish-crosses-atlantic-on-paddle-board/. Thank you.